The National Defense Committee of the National Assembly will have its final meeting in the morning of Nov. 16, Friday, in Korean time. Its’ Nov. 12 meeting was dissipated because of wide gap between the ruling and main opposition party. But since then the Democratic United Party (DP), the main opposition party has shown its compromising attitude that it is considering to agree with the ruling Saenury Party (New Frontier Party) to pass all or part of the proposed budget on the Jeju naval base project, to the indignation of people. The people here have mobilized themselves to protest to the members of the DP through email, phone and SNS. There was people’s emergency press conference on Nov. 15. How you can help us overnight in short time? Please see the part 2 of this article. 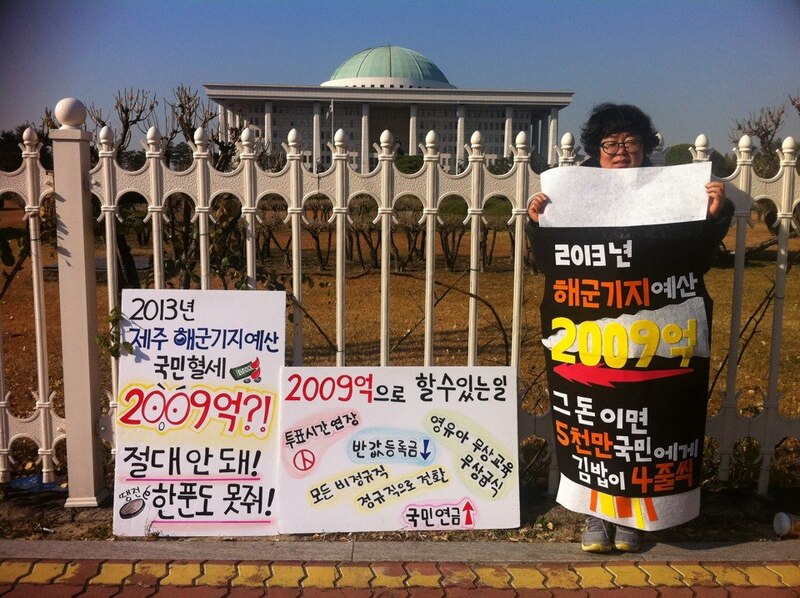 On Nov. 15, there was people’s emergency press conference to demand ruling and opposition parties to cut the whole 201 billion won of 2013 Jeju naval base project budget in front of the National Assembly at 1:30 pm. The Press conference was hosted by the Gangjeong Village Association, Jeju Pan-Island Committee for the Stop of Military Base and for the Realization of Peace Island (26 groups), National Network of Korean Civil Society for Opposing the Naval Base in Jeju Island (125 groups). Please watch Dungree video Here (Youtube). You can see the original Korean statement here (posted by the PSPD). Even though the Budget and Balance committee of the National Assembly 2011 has recommended the government and navy “to objectively verify on the safety matters of entry & exit of port and coming alongside & out of port by the 150,000 ton cruises through the 3rd institute,” the government and navy have ignored it. Despite that, the members of the ruling and opposition parties in the National Defense committee are to pass 200.9 billion won on the 2013 Jeju naval base project, without asking the matter on the execution on the National assembly recommendation item. 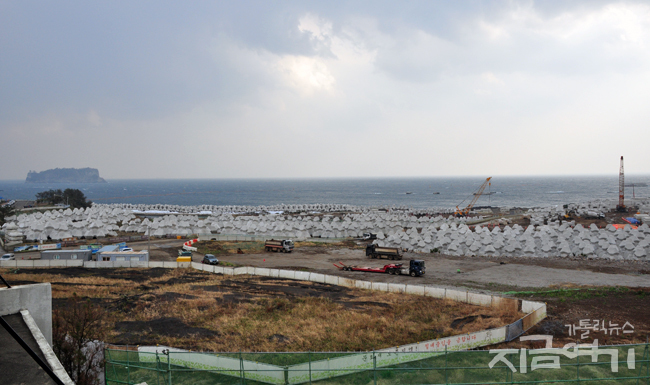 The Jeju naval base project currently being enforced is in violation of the 2007 National assembly subsidiary opinion of ‘Civilian-Military Complex Port of Call,’ (* the Lee Myung Bak government has enforced the project under the title of the Civilian-Military Complex Port for Tour Beauty) and also in violation of the 2011 Budget and Balance committee of the National Assembly recommendation item, the demand of verification on the possibility of entry & exit by 150,000 ton cruises. It is a case when a strict response by the National Assembly is needed in the sense that those are of ignorance of the authority of the National assembly that monitors the Administrative. Therefore it is reasonable that the National Assembly cut all 2013 budgets on the Jeju naval base, according to the agreement between the ruling and opposition parties. […] However, Han Ki-Ho (* a former high-rank army commander), member of the Saenuri Party, the person concerned in the ruling and opposition party’s agreement [in 2011] as a member of Budget and Balance Committee and now a chairman of the National defense committee shows shameless appearance to condemn the voice on budget as if it is from that of pro North Korea. There are some useful points to remind in the people’s protest letters to the two big ruling and opposition parties. Here are some excerpted translations. The government stated only today that it would accept the opinion by the Jeju Island government on simulation verification(It is in fact ‘revelation’ not ‘verification by the words of the Office of Prime Minister)‘. However, it has already been proved out that the [projected] port is difficult not only for 150,000 ton cruise’s entry-exit and coming alongside the pier but also for military vessels to properly enter and exit, through the meeting minutes by the ‘technical verification committee on the entry/ exit of cruse’ set up following the navy resource and National Assembly recommendation. Also construction has been unreliably, roughly-and-readily being done. So caissons that are to be used for port & bay construction have been completely destroyed, too. It is judged that the safety of port itself would not be guaranteed either. 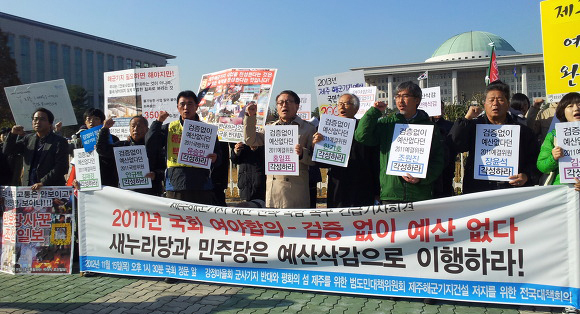 The Saenuri party thinks the Jeju naval base is certainly necessary for national security. However, if the Saenuri Party truly thinks security, it should take the lead to cut all budgets on the Jeju naval base project. It is because the Jeju naval base currently being constructed in Gangjeong has no validity for project purpose. It cannot even properly be used as a military port. The government takes protection of southern sea area and sea transportation lane as the purpose of the Jeju naval base project. However, there is no need to be stubborn to build the naval base in Jeju to protect the southern sea water. The government has already measure of the 3rd fleet in Mokpo that does not need another base in Jeju. Further the task of sea transportation lane is originally the duty of coast guard and it is never appropriate that military vessel steps for that, given the geographical conditions and relationship with nearby countries. The remarks by Park Ji-Won, floor representative of Democratic United Party, who said that ‘[the party] would confirm on the test result on the entry/exit of port and then allocate budget,’ is never realistic, given the time to be taken for verification and schedule on budget review. Further in the situational condition that the Office of Prime Minister and navy enforce construction (destruction), ignoring the resolution by the National Assembly who demanded verification through simulation, there is no other alternative than to cut the whole budget (* so construction is to be stopped) to enforce verification. We worry to see the words by [Moon Jae-In], Presidential candidate and [Park Ji-Won] floor representative to be over turned in a week. It seems that the reason that the Democratic United Party changed its position on the matter of cut on the Jeju naval base budget is because it judged that it would influence not good effect in the Presidential election due to expected repulsion by the navy and conservative class and political aggression by the Saenuri party. However such position is defensive and passive without clear and reasonable basis. In last [April 11] election, all the three Democratic United Party members who oppose naval base have been all elected in Jeju. If the candidate and Democratic United Party actively make public to citizens on various problems on the Jeju naval base in the mainland, it can get superior position in public opinion. The Democratic Party should take a lesson of a case that the people have rather punished the Grand National Party(former Saenuri Party) when the DP actively responded to the GP with the ‘war power vs. peace power’ frame, facing against the GP who intended to win over DP in June 2 local election, abusing the Cheonan ship incident for hunting so called the ‘pro north-Korea’ groups. 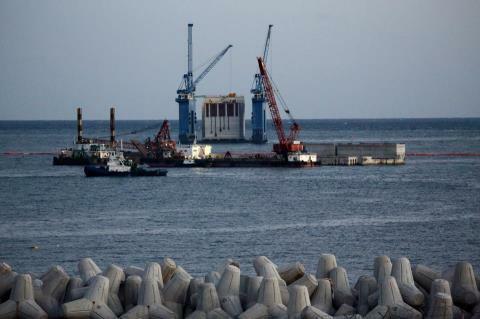 Photo by Cho Sung-Bong/ Despite the Island governor’s demand to the navy on Oct. 30 to pose the input of caisson until the finish of simulation on 150,000 ton cruise, the navy thoroughly ignored that. The navy-contracted company is moving caisson on Nov. 14. See more photos by Cho, here. 2. URGENT: Please take 1 min. to help us. Please copy and paste the below and send it to these address below, with your name. You may change contents, of course. Thanks so much in advance. Dear Democratic United Party members of National Defense committee of the ROK National Assembly. Please cut all the budgets on the Jeju naval base project. I heard that your party is considering to agree with the ruling Saenuri party to pass the budget in all or part in the National Assembly. It is a shame that your party considers it despite all illegal, undemocratic, environment destructive, human rights- violating matters of the Jeju naval base project that became clear to the eyes of internationals. I was also shocked to hear that the Jeju naval base is nothing but the US base as the Commander of the US navy forces of Korea has intervened in the base design for US nuclear aircraft carrier and US submarines. Do you truly want the South Koreans’ tax paid for the US war base against China? It will greatly disturb peace in the North East Asia and world. Please remember that your deed will affect not only Koreans but voiceless creatures and people in the world. It is unbelievable and shame if your party agrees to pass the budget. Please stand on your original position of cutting all the budget of 201 billion won on the naval base project 2013. Please watch this 7 min. video taken by Kim Goon, a peacekeeper that daily appears in the protest site of the naval base construction gate. . 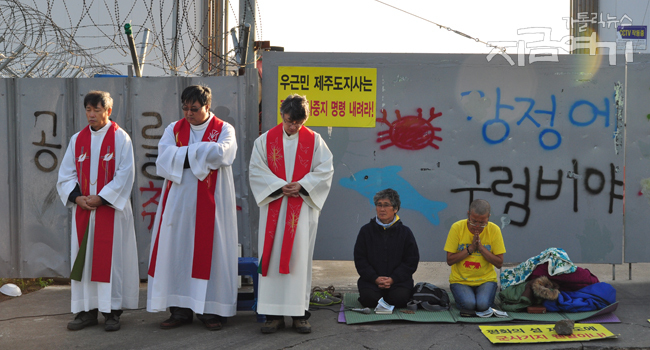 The peacekeepers in Gangjeong persistently protest to stop the cement mixer trucks .The video was taken at 3:10pm, Nov. 14. They are fighting for the Jeju naval base project budgets not to be executed but cut, despite the police violence and humiliation. 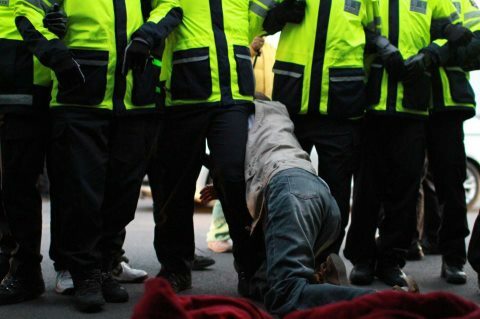 The police from Seoul were more violent on Nov. 16. They are the maneuver units of No. 21(male) and 24(female). The police were also violent on Nov. 15, probably because the Democratic United Party members showed compromising attitude on budget. A young activist was carried to a hospital during the protest on Nov. 15.